Going by this piece of information from the AnTuTu database we can see that the Snapdragon 810 chipset is currently in its testing phase. The chipset is being tested on a 6.2″ device that boasts of a screen resolution of 2560 X 1600. With the Snapdragon 810 chipset lies 4 GB of RAM under the hood and a CPU whose frequency has been detected somewhere between 200-940 MHz. At its maximum performing capability, the CPU can run at 2 GHz. The Snapdragon 810 chipset will boast of four Cortex-A57 and four Cortex-A5 processors which consume up-to 20% less power and are better at performance by upto 50%. Talking about he GPU you have an yet-unseen Adreno 430 which too is faster than its predecessor the Adreno 420 by upto 20%. 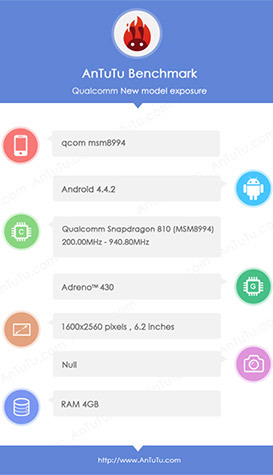 There are also rumors that the Snapdragon 810 chipset will be featuring on the upcoming Nexus 6 but we had a look at the specs list of the Nexus 6 and it didn’t look so. But then what we looked at could just be a prototype and Nexus 6 might have something bigger on board.